Background: Cardiovascular (CV) morbidity and mortality are higher among patients with diabetes mellitus type 2 (T2DM), particularly those with concomitant CV diseases, compared with other populations. In patients with T2DM, intensive glucose lowering reduces microvascular disease, but has a smaller and debated effect on CV events or mortality. In this setting, the US Food and Drug Administration (FDA) required in 2008 that all new agents for the treatment of T2DM should be evaluated in terms of CV safety. Metformin has long been established as first-line pharmacological therapy in patients with T2DM, due to its proven beneficial CV effects. Despite the controversies about the issue of the CV safety of other oral antidiabetic agents such as sulfonylureas (SUs) and thiazolidinediones (TZDs), long-term randomized trials suggested neutral effects of these agents on macrovascular disease. 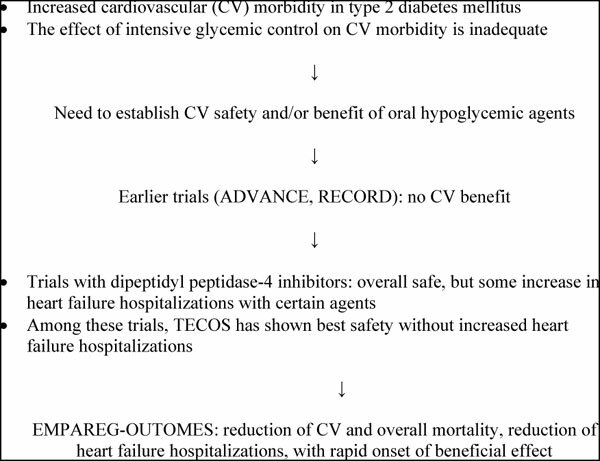 Moreover, there are a number of CV outcome trials designed to determine the long-term CV safety of new glucose-lowering agents, like dipeptidyl peptidase 4 (DPP-4) inhibitors, and sodium glucose cotransporter 2 (SGLT2) inhibitors. Although the results of these trials indicate the CV safety of oral new antidiabetic agents, only one of them (with empagliflozin) has so far reported reduction of CV events. Recently, LEADER (Liraglutide Effect And Action in Diabetes: Evaluation of Cardiovascular Outcome Results - A Long-term Evaluation), a CV outcome trial in diabetic patients by using an injectable glucose-lowering agent (liraglutide) has also reported a reduction in CV outcomes. Conclusion: The present review considers the long-term CV effects of anti-diabetic drugs and updates the relevant randomized CV outcome studies of oral glucose-lowering agents. Keywords: Diabetes mellitus, cardiovascular outcomes, antiplatelet drugs, DPP4, SGLT2, metformin, sulfonylureas. Keywords:Diabetes mellitus, cardiovascular outcomes, antiplatelet drugs, DPP4, SGLT2, metformin, sulfonylureas. Abstract:Background: Cardiovascular (CV) morbidity and mortality are higher among patients with diabetes mellitus type 2 (T2DM), particularly those with concomitant CV diseases, compared with other populations. In patients with T2DM, intensive glucose lowering reduces microvascular disease, but has a smaller and debated effect on CV events or mortality. In this setting, the US Food and Drug Administration (FDA) required in 2008 that all new agents for the treatment of T2DM should be evaluated in terms of CV safety. Metformin has long been established as first-line pharmacological therapy in patients with T2DM, due to its proven beneficial CV effects. Despite the controversies about the issue of the CV safety of other oral antidiabetic agents such as sulfonylureas (SUs) and thiazolidinediones (TZDs), long-term randomized trials suggested neutral effects of these agents on macrovascular disease. Moreover, there are a number of CV outcome trials designed to determine the long-term CV safety of new glucose-lowering agents, like dipeptidyl peptidase 4 (DPP-4) inhibitors, and sodium glucose cotransporter 2 (SGLT2) inhibitors. Although the results of these trials indicate the CV safety of oral new antidiabetic agents, only one of them (with empagliflozin) has so far reported reduction of CV events. Recently, LEADER (Liraglutide Effect And Action in Diabetes: Evaluation of Cardiovascular Outcome Results - A Long-term Evaluation), a CV outcome trial in diabetic patients by using an injectable glucose-lowering agent (liraglutide) has also reported a reduction in CV outcomes.